GRAND CANYON NATIONAL PARK, Ariz. (AP) — A lodging complex at the Grand Canyon's South Rim that is nearly 50 years old is being replaced. SANTA FE, N.M. (AP) — Members of Congress are gathering in Santa Fe this month to hold a hearing on the impact of oil and gas development on sites that tribes consider sacred. GRAND CANYON NATIONAL PARK, Ariz. (AP) — A Los Angeles artist's lawsuit against a Grand Canyon hotel-restaurant that alleges he was negligently served gluten is now in federal court. 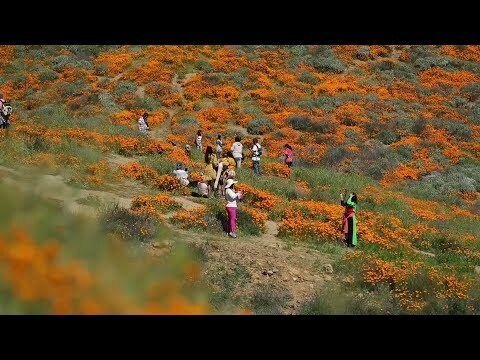 LAKE ELSINORE, Calif. (AP) — The problem of overwhelming crowds flocking to see a super bloom of poppies in a Southern California canyon is no longer just a weekend issue. SALT LAKE CITY (AP) — Six people were caught, and three of them were injured, in an avalanche in Cardiff Fork, located near Big Cottonwood Canyon. IVINS, Utah (AP) — Authorities say a teenage boy has died after falling inside Snow Canyon State Park in southwestern Utah. PITTSBURGH (AP) — Ellsworth Kolb left Pittsburgh in 1900 with $2 in his pocket. He nearly ended up in China. JACKSON, Wyo. (AP) — Another lost skier has been rescued in Grand Teton National Park in northwest Wyoming.